The following document was obtained from the public website of a national disaster recovery network. 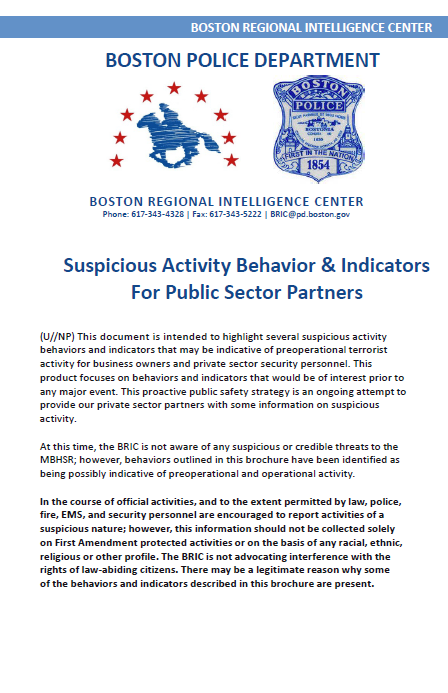 (U//NP) This document is intended to highlight several suspicious activity behaviors and indicators that may be indicative of preoperational terrorist activity for business owners and private sector security personnel. This product focuses on behaviors and indicators that would be of interest prior to any major event. This proactive public safety strategy is an ongoing attempt to provide our private sector partners with some information on suspicious activity. At this time, the BRIC is not aware of any suspicious or credible threats to the MBHSR; however, behaviors outlined in this brochure have been identified as being possibly indicative of preoperational and operational activity. In the course of official activities, and to the extent permitted by law, police, fire, EMS, and security personnel are encouraged to report activities of a suspicious nature; however, this information should not be collected solely on First Amendment protected activities or on the basis of any racial, ethnic, religious or other profile. The BRIC is not advocating interference with the rights of law-abiding citizens. There may be a legitimate reason why some of the behaviors and indicators described in this brochure are present. • Eliciting Information: Questions focused on operations, security procedures, entry points, security checkpoints, crowds, access controls such as alarms, locks and cameras; or questions about a facility’s air conditioning, heating and ventilation system. This includes individuals questioning employees in person, on or off-site, over the phone or via the Internet. or making false fire alarms and bomb threats. • Photography: Taking pictures or video of facilities, infrastructure, personnel, surroundings, or crowds. • Observation/Surveillance: Showing unusual interest in facility/ infrastructure/personnel and monitoring the activity of people, facilities, processes or systems; for example, taking notes, drawing maps, observing first responder drills or procedures; this may include multiple false alarms or emergency calls to the same locations or similar venues. • Theft/Loss/Diversion: Stealing or diverting something associated with a facility/infrastructure; for example: badges, uniforms, identification, emergency vehicles, technology, or documents; these items may be used to misrepresent one’s identity in order to gain access to secure areas or information. • Sabotage/Tampering/Vandalism: Damaging, manipulating, or defacing part of a facility/infrastructure, such as security cameras or a protected site. • Expressed or Implied Threat: Communicating a spoken or written threat to damage or compromise a facility/event/person. • Other: Other behaviors that may be suspicious in nature include: hotel guests who deny housekeeping from performing routine cleaning duties over a period of several days; evidence that guests have changed their physical appearance, a request at check in for views of specific areas of interest; suspicious parcels and packages (protruding wires, unusual smells, greasy marks, unknown source/sender); possession or viewing of extremists propaganda, including unusual searches on public computers, such as instructions on how to make weapons, or web browsing of extremist websites that advocate violence. (U//NP) Below is a list of behaviors operatives may exhibit prior to launching an attack; please note that an individual displaying one of more of these indicators cannot necessarily be identified as a probable terrorist. These indicators need to be considered with other factors. • (U//FOUO) Ambivalent or anxious behavior, such as retracing steps or movements, or engaging in seemingly purposeless actions. • (U//FOUO) Remain alert and vigilant for suspicious individuals / objects and report anything that sticks out as suspicious to the Boston Police Department.